The foundation Working with Goldstein develops and produces materials which can be used for Aggression Replace- ment Training®. This site provides you with background information on the Goldstein, Glick and Gibbs method based training. For I-phone and I-pad we created this App. 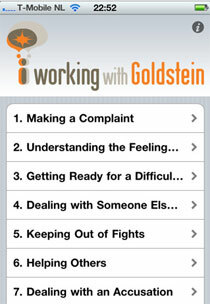 By using this App you have always easy access to the steps necessary to carry out the social skills of the ART method. At the Stavanger Seminar in Hogskole at 8 dec. new Norwegian Art material will be presented. Dr. Peter Bleumer, our trainer, will give an example of how we work in Holland with this Method. We are proud to announce that we have developed a new ART® DVD exclusively for the American market. It is now available! This DVD contains user-friendly cognitive behavioral intervention tools to support practitioners in their programming at work with at-risk and aggressive youth to alter their behavior. These materials are based on the Aggression Replacement Training® program. Anger Control Training, the emotional component. Moral Reasoning, the value component. Comic strips, which are recommended to use during the ART® program, are now available. These comics are useful colourful tools and attractive to youth. The comic strips are laminated.